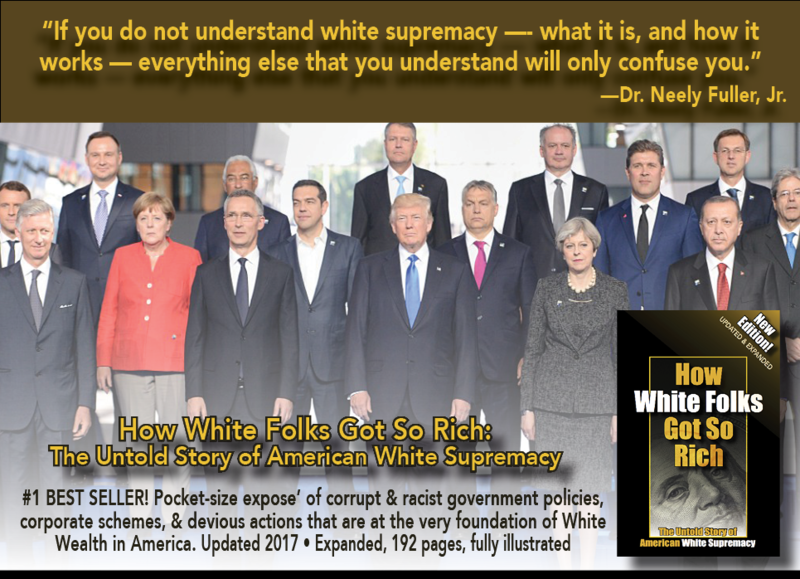 Pocket-size expose’ of corrupt & racist government policies, corporate schemes, & devious actions that are at the very foundation of White Wealth in America. The richest 1% of America’s families own nearly 50% of the value of stocks, bonds, and other financial instruments, real estate, and businesses. To make it into the 1 percent, you need to have at least $350,000 a year in income, or around $8 million in accumulated wealth. America’s 20 wealthiest people—a group that could fit comfortably in a single luxury jet—own more wealth ($732 billion) than the bottom half of the American population combined, a total of 152 million people living in 57 million households. The richest 10% of America’s families—those who hold at least $942,000 in wealth—control a little over three-quarters of all family wealth in the U.S. The richest 20% of American households now own more than 84 percent of the nation’s wealth, with the poorest 40% owning a paltry 0.3 percent. The top 10% of Black Americans account for 67% of wealth held by all U.S. Blacks. America’s 100 richest households now own about as much wealth as does the entire Black population of the United States. The wealthiest 186 members of the Forbes 400 own as much wealth as the entire U.S. Latino population. For every dollar of wealth owned by a white family, a Black family owns less than 6 cents; a Latino family owns 7 cents. The average liquid wealth of white Americans ($23,000 in cash reserves) is now over 100 times that of Blacks and more than 65 times that held by Latinos. About one-quarter of Black American families had less than $5 in reserve; low-income whites had about $3,000. Before the 2008 recession, white families in the U.S., on average, were about 4 times as wealthy as “nonwhite” families. 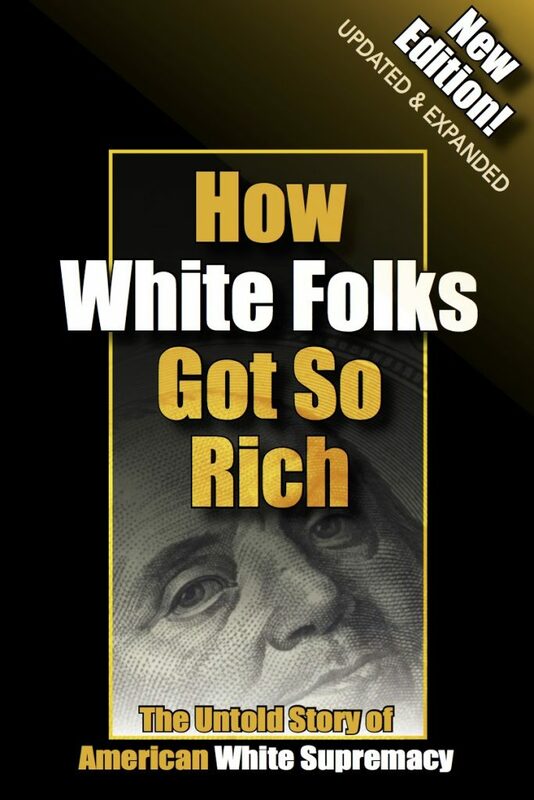 By 2010, whites were about six times as wealthy. If current economic trends continue, the average Black household will need 228 years to accumulate as much wealth as their white counterparts hold today. For the average Latino family, it will take 84 years. Single Black women (across all ages, from age 18 to 64) have a median wealth of $100 and single Latinas have a median wealth of $120. The figure for single white women? $41,000. Marriage is positively correlated with higher wealth levels: 64% of the richest five percent of Black Americans are married or live with a partner versus just 39% for the Black American population as a whole. The 80 richest people in the world have as much wealth—$1.9 trillion—as the poorest 3.5 billion people at the bottom half of the world’s income scale. Twenty-nine of the 50 richest on earth are American billionaires, who have $938 billion between them. The earth’s richest 1% now owns some 50% of the world’s wealth, while the bottom 80% of the planet’s inhabitants have less than 6% between them. Blacks, despite making up 13% of the population, own less than 1% of rural land in the U.S. The combined value of that land: $14 billion. The five largest landowners in America—all white—own more rural land than all of Black America combined. That tiny group owns more than nine million acres, while all of the Black population combined—over 40 million people—own just under eight million acres. White Americans own more than 98% of U.S. agricultural land, amounting to 856 million acres with a total worth of over $1 trillion. The unemployment rate in the U.S. as of late 2016 is 5 percent—a little over 4% for whites and just over 8% for Blacks. Native Americans have the lowest employment rate of any racial or ethnic group in the United States. The Apache Tribe of Oklahoma, also known as the Plains Apache, has an unemployment rate of 87%. The average Black unemployment under President George W. Bush was 10 percent. Under President Barack Obama it was 14 percent. It hit 16%—a 27-year high—in late 2011. Black unemployment rates have consistently remained about twice that of the white rates across time, regardless of education. According to a 2012 Department of Labor report, unemployed Blacks with only a high school diploma experienced a 24.6% unemployment rate, compared with 12.7% for whites with the same educational level. In 2015, the unemployment rate was 5.2% for Black workers with at least a bachelor’s degree and just 2.9% for whites. Job applicants with “black-sounding names” had to send out 50% more applications than people with “white-sounding names” just to get a call back. Young Black men ages 16 to 19 have higher unemployment rates than both young white men and young Black women in the same age group. Since the Great Recession, Black male teen unemployment has spiked five times and now sits at more than 30 percent. One-in-three (33%) Blacks in their late teens and one-in-five (20.2%) Blacks in their early twenties are unemployed. High unemployment rates among young Blacks early in their careers hurt their long-term employment and earning prospects. Blacks are 2.5 times more likely than whites to be long-term unemployed, with two out of every five unemployed Blacks searching for work for more than six months. Blacks are also more likely than whites to be underemployed. White families, on average, earn about $2 for every $1 that Black and Latino families earn, a ratio that has remained roughly constant for the last 30 years. In 2015, white households earned a median income of $60,109, compared with a median household income of $36,898 for Blacks. Black women working full-time earn 63 cents for every dollar white men earn. Latinas working full-time earn only 54 cents for every dollar white men earn. Black women make up a larger percentage of the low-wage workforce (11.6%) than of the overall workforce (6.1%). Latina women make up 15% of the low-wage workforce. Black men working full time earn 72% of the average earnings of comparable white men and 85% of the earnings of white women. Black men weekly earn $652 versus $899 for all men. Black women’s weekly earnings: $608 versus $721 for all women. All Black workers’ 2015 weekly earnings were $624 versus $803 for all races. Median weekly earnings of full-time Black workers with bachelor’s degrees are roughly $900 compared to over $1,100 for whites—a difference of about $12,000 over the course of a year. Five groups more likely to use a payday loan: Blacks; people without a four-year college degree; home renters; people who earn less than $40,000 a year; and those who are separated or divorced. The average borrower takes out eight loans of $375 and spends $520 on interest alone by the time the initial loan is repaid. Among American adults, 23 percent of whites are lower income, 52% are in the middle-income tier, and 25% are upper income. For Blacks, 43% are lower income, 45% are middle income, and only 12 percent are in the upper-income tier. The median household income for foreign-born Blacks is 30% higher than that for U.S.-born Blacks. The Black immigrant population in the U.S. has a higher percentage of entrepreneurs and an increased ability to keep dollars in their own communities. Between 2009 and 2012 the top 1% of Americans enjoyed 95% of all income gain. It was the worst disparity since 1928. America’s top 20% receives about half (51.3%) of all income. Meanwhile, 8 in 10 Americans are in (mortgage and nonmortgage) debt. Married adults (both with and without children at home) are more likely than unmarried adults to live in upper-income households and less likely to be in lower-income households. Still, high-earning married Black households have, on average, less wealth than low-earning married white households. The U.S. poverty rate is higher now than it was in the late 1960s: today over 43 million Americans live in poverty, as officially defined by the Census Bureau. Black Americans—about one in four—are almost three times more likely to live in poverty than white Americans. The percentage of Blacks in poverty in 2015 was 24.1 percent, while the rate for the overall population was 13.5 percent. The poverty rate for whites: 9.1%. In 2015 the poverty rate for American Indians was nearly 27 percent, the highest rate of any race group. More than one-in-four American Indians live in poverty. Two of the five poorest counties in the U.S. are located on Indian Reservations. In 2016 white households living around the poverty line—defined as a total income of $24,250 for a family of four—have a net worth of $10,000 to $15,000, but the typical Black family at that income level has a negative net worth. According to the latest statistics, more than half (51.4%) of Black families with children under 18 are headed by a single mother, compared to one-fifth (19.1%) of white families with children; and nearly 47% of families headed by a Black single mother are in poverty. Whites receive more than their proportionate share of entitlement benefits. They accounted for 64% of the population but received 69% of the entitlement benefits. In contrast, Latinos made up 16% of the population but only received 12% of the benefits. 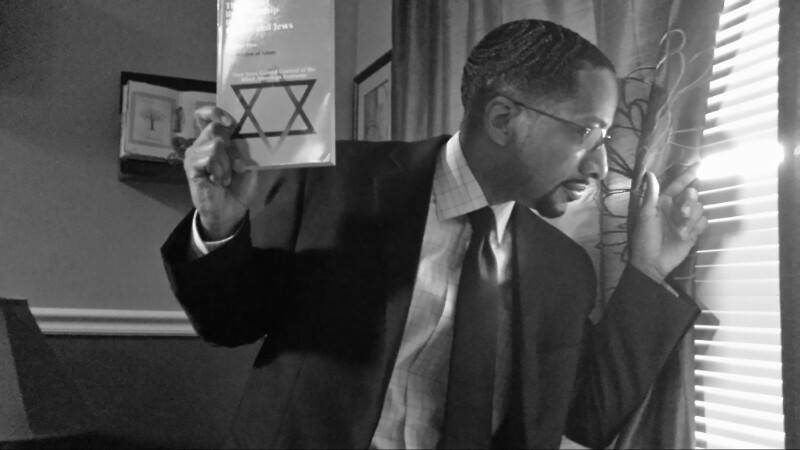 Blacks account for 13% of the population and received 14% of the benefits. Poor Blacks are far more likely to live in blighted and poverty-stricken neighborhoods, while most poor whites live diffused among middle- and even upper-class white areas. Poor whites actually live in more affluent neighborhoods than do even middle-class Blacks, who are then more likely to contend with weaker schools, higher crime, and greater social problems. For most Americans most of their wealth is in their homes. But it represents a much larger share of the net worth of the typical Black or Latino homeowner (58 percent) than of the typical white homeowner (37 percent). Black homeowners who took out mortgages between 2004 and 2008 were almost twice as likely as white homeowners to have lost their homes to foreclosure by 2011. One-in-ten Black homeowners who took out mortgages at the height of America’s housing bubble in 2006 eventually lost their home to foreclosure. As a result of the disproportionate number of foreclosures borne by Blacks and Latinos, the “spillover” costs—in the form of depreciated home values, increased crime rates, and community blight—hit Black and Latino communities particularly hard. It is estimated that, between 2009 and 2012, $194 and $177 billion, respectively, was drained from Black and Latino communities in just those indirect “spillover” losses alone. Owner-occupied homeownership, 2016: for whites, 72%; for Blacks, 41.3%—a steep decline from a record high of 49.1% in 2004. Homeownership among Latino households has seen a 5% decline, from 49.7% in 2004 to 47% today. Blacks and Latinos are more likely than whites to receive high-cost mortgages for home purchases: Blacks (105 percent) and Latinos (78 percent). Nationwide, Black families earning around $230,000 a year were more likely at the height of the housing bubble to be given a subprime loan than white families making about $32,000. In 2014, only 1.7% of $23 billion in Small Business Administration (SBA) loans went to Black-owned businesses, the lowest on record. During the Bush presidency, the percentage of SBA loans to Black businesses was 8% — more than four times the rate under President Obama. The number of Black-owned firms grew 34.5% between 2007 and 2012—from 1.9 million to 2.6 million in 2012. In contrast, the total number of firms in the U.S. increased just 2% during the same period, from 27.1 million in 2007 to 27.6 million in 2012. However, the proportion of Black-owned businesses accounted for 9.4% of all firms, which is still below the 13 percent Black American share of the U.S. adult population. While the number of Black-owned firms represented 9.4 percent of all firms, the $150.2 billion in sales generated from those firms were less than half of a percent (0.4 percent) of the total sales for all firms ($33.5 trillion) in 2012. The number of businesses owned by Black women grew 322% since 1997, making Black women the fastest-growing group of entrepreneurs in the U.S. Black women start businesses at six times the national average and now own 14% of all women-owned businesses in the U.S., or an estimated 1.3 million firms, employing 297,500 workers and generating $52.6 billion in revenue. Even though Black-owned businesses were predominantly women-owned (58.9 percent), approximately two‑thirds (66.7 percent) of the $150.2 billion in sales generated by America’s Black-owned firms were from male-owned businesses ($100.1 billion). There have been only 15 Black CEOs in the history of the Fortune 500, of whom only five (soon to be four) are currently at America’s 500 biggest companies. There are currently no Black-majority-owned companies in the Fortune 500 rankings.